Today I was honored to spend the morning with the Department of Virginia Game and Inland Fisheries biologists who control the lake [and most bodies of water north of the lake]. These are the guys who log all the data collected from netting's and shockings throughout the year and make recommendations for stocking the game fish in Lake Anna. They are responsible for this excellent Striper and Bass fishery that we are blessed to be a part of. John Odenkirk has headed up this project for many years and today's catch is a testament to the hard work him and his crew have devoted to the lake. Today we caught 275 Stripers between 6am and 1pm on hook and lines. Yea, you read that right, 275 Stripers. This morning I caught 250 baits then picked the guys up and went looking for schools. 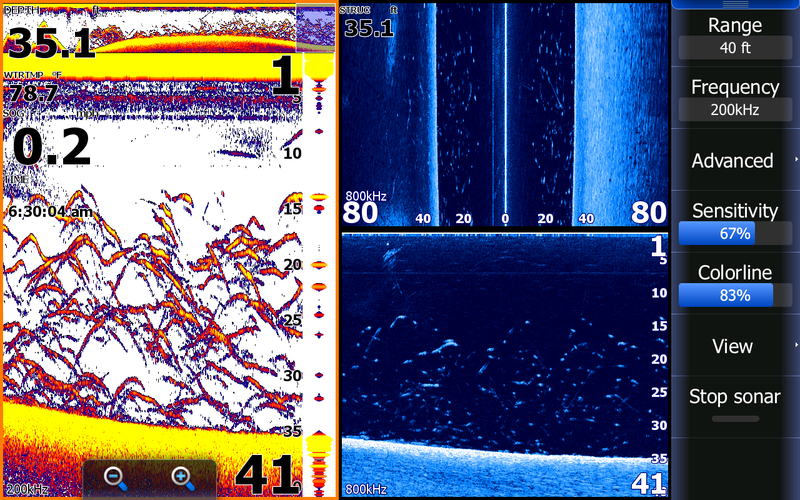 It didn't take long to find what I wanted and before anyone knew it all are rods were hooked up. It stayed that way for 45 minutes till I decided to pull them off of the school. They couldn't believe I was taking them away from fish but I knew of so many schools I thought it was time to leave that school alone and work another. I went right to another school and worked it for 30 minutes constantly having fish hooked up. By now we were out of bait so I located some bait, filled two tanks back up with 200 baits and took off. We hit school after school catching fish constantly till we ran out of bait again. I collected another 200 baits and hit one final area. We worked it using up every single bait in the tanks. Our final count was 275 Stripers. They kept their limits and released all the other fish. 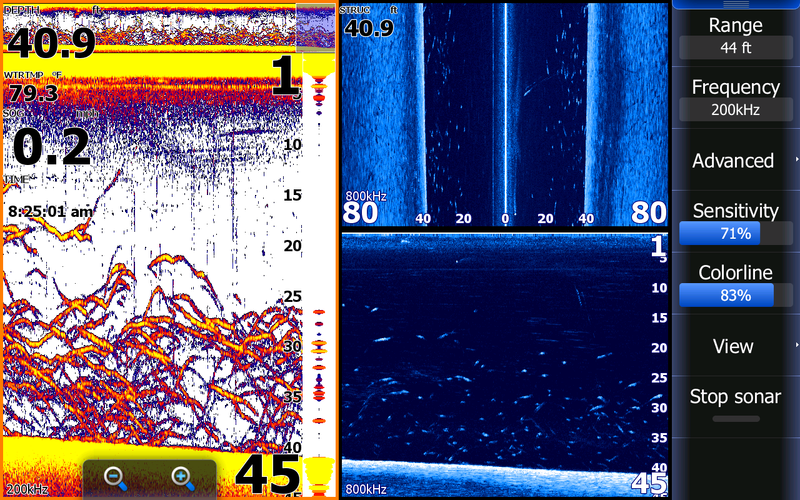 The upper two pics of my Lowrance are when we were working the first school of the day. The lower pic is a school where we caught about 50 Stripers out of. Some of these school were acres upon acres of fish. Funny thing was the fish were really not active and biting well today. 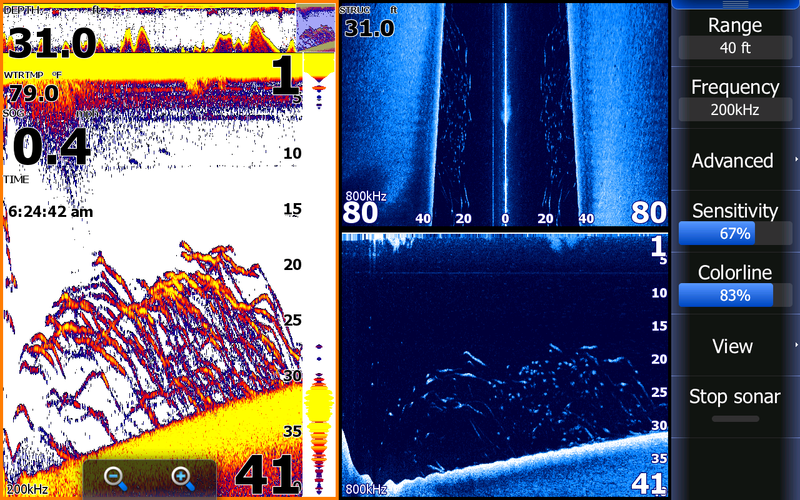 You can see that very few fish were "Streaking", a sure sign of inactive fish. In my experience if the fish would have been on a major feed the graph would look completely different and our catches would have been better. No one complained about the fishing today though, it was a lot of fun. The guys went home with plenty of filets and tore up thumbs. This is the beginning of our summer season. The action is incredible and at least FOUR anglers is a must to be able to handle the action. Don't miss out on some great summer fun, book a trip for some great memories.